OK folks, this recipe for Pizza Bianca is not really a traditional pizza. It’s actually more like a really, really special Quesadilla. In any case, it is really, really good! 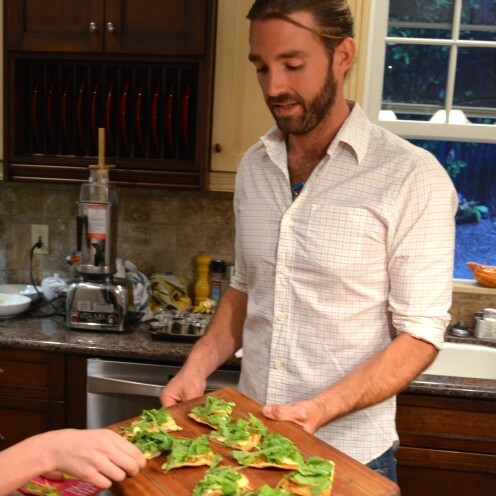 Chef Julian made it as one of 4 outstanding appetizers for our recent girl’s night. I think it would make a great holiday appetizer. Julian was kind enough to share the recipe with me so that I can share it with you! 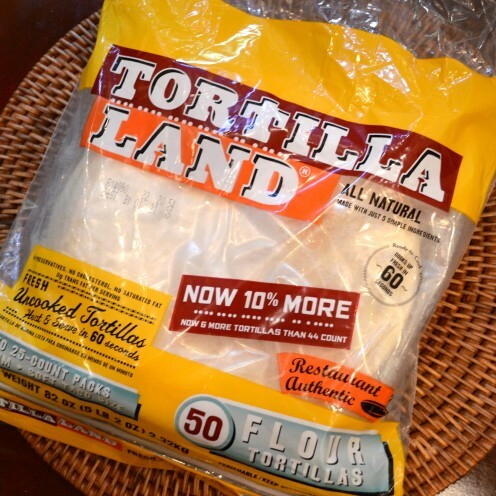 It starts with flour tortillas, but not just any flour tortillas. Julian uses uncooked flour tortillas that can be found in the refrigerator section of most grocery stores. I buy these (see photo below) at Costco. They are really yummy! This recipe will not involve quantities because you can make as many or as few Pizza Bianca’s as you feel like eating or serving to others. So to get started preheat your oven to 425º F. Take your raw tortillas and slather them with fig jam. Chef Julian says to do this with your hands in order to get a light coverage. 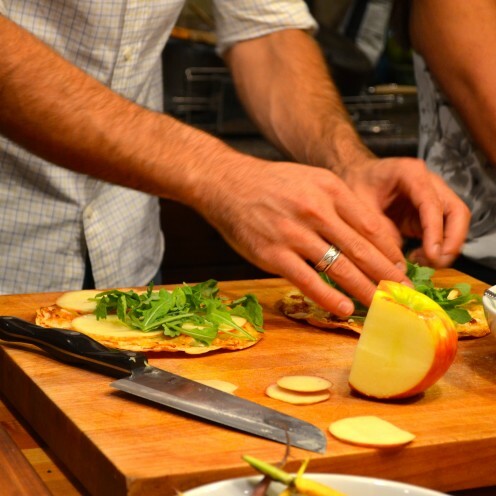 Next, sprinkle the tortilla lightly with goat cheese that you crumble up with your hands also. Then sprinkle on a light layer of grated, whole milk mozzarella cheese and place tortillas on a baking dish. Pop them in your preheated oven and bake until bubbly and golden brown and the tortilla is crisp but not too hard, about 6 minutes. 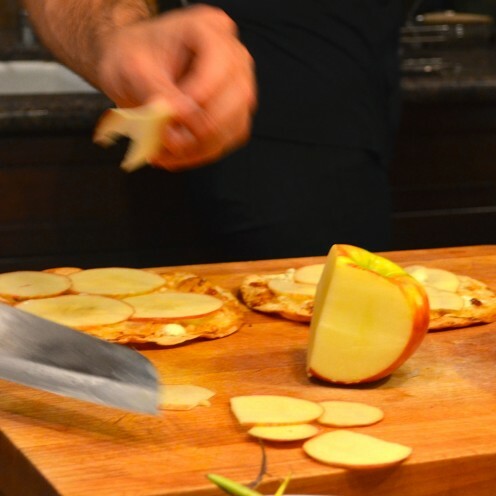 Finally, cut pears or apples using a mandoline preferably, into very thin and large slices. Place them on the piping hot Pizza Bianca. Now, in a small mixing bowl drizzle a generous amount of truffle oil, salt and freshly ground pepper over baby arugula. Toss to coat. Pile the arugula on the pizza then cut into wedges. Serve hot to your very happy guests. Although Chef Julian calls these "Pizzas" they are more like a delicious and unique take on a Quesadilla. Slather the raw tortillas with fig jam. Sprinkle the tortilla lightly with goat cheese that you crumble up with your hands. Place tortillas on a baking dish. Pop them in the preheated oven and bake until bubbly and golden brown and the tortilla is crisp but not too hard, about 6 minutes. Place apple or pear slices on the piping hot Pizza Bianca. In a small mixing bowl drizzle a generous amount of truffle oil, salt and freshly ground pepper over baby arugula. 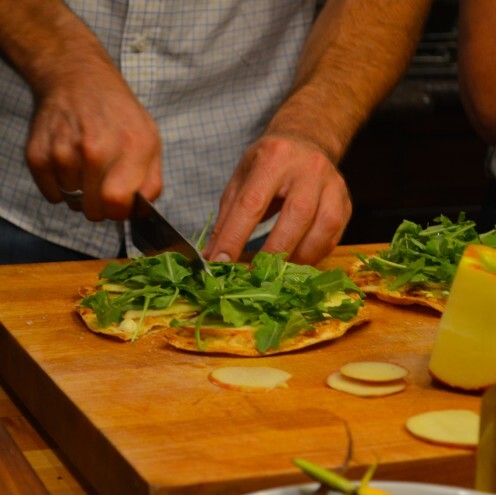 Pile the arugula on the pizza then cut into wedges and serve . If you’d like to read After Orange County every time a new article is posted, please “Subscribe” to the blog using the Subscription Box above. If you enjoyed this post, please help me spread the word by sharing it on your Facebook Page. You can “Like” my Facebook Page here. If you enjoyed the photos, please “Pin Them” on your Pinterest page. You can follow my Pinterest Page here. Do you Tweet? Please follow my Twitter Page here.